Chamundeshwari Temple is located on the top of the Chamundi Hill, where Chief Minister Siddaramaiah will inaugurate a few sports and cultural events. The elephant procession called Jumboo Savari will be held on September 30th this year. Mysuru: The festival of Dussera or Dasara as it is popularly called in Karnataka began today in the city of palaces - Mysuru. Chief Minister Siddaramaiah inaugurated the ten-day long festival at the Chamundeshwari Temple, about 13 km from the city. The Chamundeshwari Temple is located on the top of the Chamundi Hill, where the chief minister will also inaugurate a few sports and cultural events. It is believed that Mysuru got its name after the demon Mahishasura was slayed by Goddess Chamundeshwari (Durga). Although, Dussehra, which signifies the victory of good over evil, is celebrated with different traditions and rituals throughout the country, its celebrations are particularly unique in Mysuru. 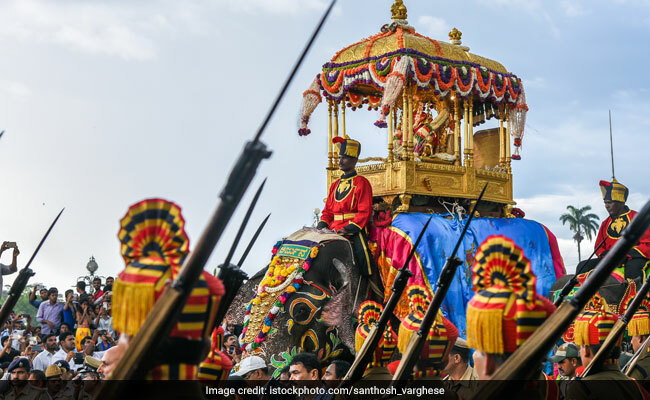 The highlight of the festival here is the Jumboo Savari - the elephant procession that begins at the Mysuru palace and winds through the streets of the city to Banni Mantapa. The elephants used in this procession spend most of the year in a camp in the Nagarahole sanctury but are brought to Mysuru two months ahead of the festival to get them used to the procession route and the city sights and sounds. The procession will be held on September 30th this year. The Mysuru palace, the abode of the Wodeyers, is lit up every year during Dasara with almost one lakh bulbs. The Wodeyer dynasty ruled the Kingdom of Mysore from 1399 to 1950, with a brief interruption in the late 1700s. The festival organised to celebrate Dussehra 2017 will complete 407 years this time.